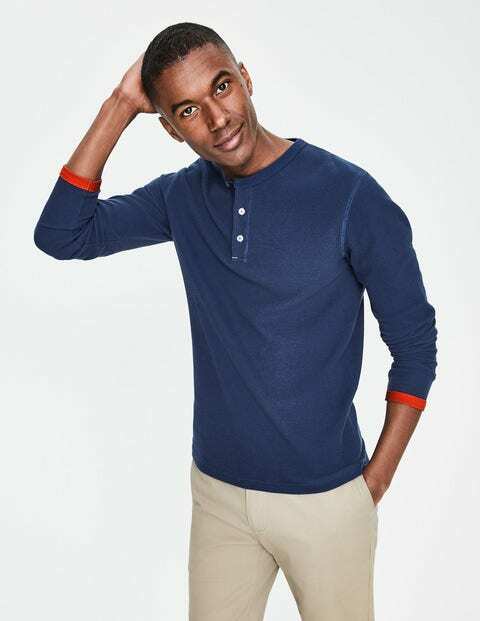 You may not be a rower, but that doesn't mean you can't get onboard with our long-sleeved Henley T-shirt. Cut from lightweight, textured jersey, it features subtle stitch detailing on the hem and a ribbed Henley neck. This granddad shape is smartened up by the cord-loop top button and pops of colour on the cuffs. Wear with jeans on dress-down days or layer under a jacket for a nonchalant workwear look.